Kelly Egan’s reflection on Anna Atkins and the gendered legacy of photographic art and science, Athyrium filix-femina, is now available on 35mm. The second in a series of “quilt films” that pay homage to the work of pioneering female artists, Athyrium filix-femina reimagines Anna Atkins’ foundational work in photography as a moving image. In 1843, Anna Atkins published the first book of photography, Photographs of British Algae: Cyanotype Impressions, an exploration of regional botany that classified different kinds of algae using direct prints of the plants. The cyanotype process was a relatively short-lived as a dominant form of photography, however, it found refuge in the domestic sphere where it was used to decorate fabric for pillows, drapes and clothing. By combining filmmaking and quilting, this film extends from the “domestication” of this photographic art by exploring experimental narrative and structural forms through the use of traditional “women’s work.” The “narrative” in this film is told through the symbolic patterning in quilt-making practices. Athyrium filix femina was created by adapting Atkins’ original cyanotype recipe, painstakingly coating clear 35mm filmstrip, and exposing each filmstrip to sun (sometimes for an excess of 4 hours). The images are a combination of botanical photograms (an homage to Atkins botanical images) and direct prints of found footage that tells the story of a young girl tormented by a gang of bullies and an imprisoned spider. The combination of these two dominant “fabrics” produce a feminist narrative that inherently questions malecentrism within the history of the photographic arts and sciences. 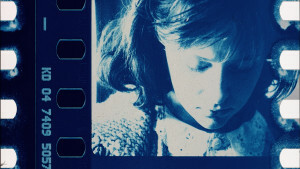 Even more than her first quilt film (c: won eyed jail, 2005, which was created as an homage to Joyce Wieland), Athyrium felix-femina combines structural filmmaking and process-based techniques in order to bring materiality of filmmaking to the forefront–but also with emphasis on the handmade aspects of the art form. By adapting and reframing historical photographic processes to highlight the unique temporality and liveness of film, this project explores not only its materiality of film, but also the interface between the histories and discourses of film and photography.